Free Lawn Care Flyer Templates for your landscaping business. If these free lawn care flyers help you, can you help us spread the word by placing this banner in your website or in your forum signatures? Leaf cleanup flyer and doc format. Two lawn care flyers per page. Black and white quality landscape care flyer. Craigslist lawn care flyer ad. Free fall cleanup lawn care flyer. Spring lawn care flyer special. Craigslist Lawn Care Ad for Spring. Tired of mowing your lawn flyer. Gutter cleaning flyer. Three per page. More free lawn care business flyers. Here is the concept behind this flyer. On a snowy day you could potentially take your snow blower and clear along a sidewalk in front of houses you would like to gain as customers. Either that day or some time after you do this, hand out these flyers to those houses and see what kind of response you get. Make sure you mark in the date you were there. Here is the concept. The customer will have to sign up for a yearly mowing contract. Find a local pizzeria that will partner up with you. Tell them you will print out these flyers with their menu on the back. Possibly have them cover half the cost of the free pizza which might be $3.00 to make? You could then pay them $1.50 for each free pizza given away to one of your contract customers. You will need to come up with a coupon to give to customers that sign up for this deal. Work the pizza price into your customers monthly contract fee. This is only an idea, if you have a better thought on how to handle this promotion, please share your idea. Here is a mid-season landscaping, lawn care, landscaper flyer to try and get potential customers to switch to you. Here is a flyer that promotes hiring a fully insured Lawn Care Operator. Stand out from others who are not insured. Some notes on these free lawn care business flyer templates. Make your target audience an offer they can't refuse. The next day you will most likely find some of the homeowners have indeed followed the steps for you to more their lawn for free. After you more the lawn, go to the door and hand the homeowner this second flyer. Show them the services you can provide them and the cost. Then try to get them to sign up with you on the spot for the services they check off. Let the homeowner know you will invoice them the end of each month. If they can't make a decision at the moment, get their number and call them when they say they will be able to have their decision by. Here is a landscaper lawn care marketing idea for Arbor Day. The concept is you are building a positive image in your community and you will be meeting many potential customers. You have a better chance to sell them on other services, once you meet them in person. You can survey their yard and mention other services they may be interested in. Possibly find a supplier of saplings you could get in bulk and then hand out these flyers in your area. Also maybe contact your local newspaper to announce you are trying to help the environment by planting free trees for Arbor Day. That should help get you some press coverage. Here is a flyer idea you could potentially use and hang up in local stores. You could collect some stories and then go for the one you choose. Create a press release and send it out to the papers when you do this. It's a great way to build goodwill in your community and get your company name out. Download the Aeration Flyer here. It's a large file almost 6 megs. More Gutter flyers are located in this post. Craigslist template ad design here. Notes on how to use these lawn care flyers for your marketing. Download and edit this flyer. Then print it out and staple a bag of grass seed to it. You can then drive down a street and throw these flyers out in no time at all without worrying about them being blown away by the wind. Why not offer these services in the fall. You already know how to fix mowers, so take advantage of that and keep yourself busy all year round! Maybe you will be able to upsell these customers on future lawn service from your company? Here is a lawn care flyer you can use to market your services to home owners trying to sell their home during this real estate down turn. Let's all get into the spirit of the holidays. I created this flyer you can edit and hand out in your area. The idea of this marketing concept is that you are going to position yourself as the go to lawn care business in your area. You are going to be the one that is leading this outdoor holiday decoration contest. If local residents dont have time to put up decorations, then you can do it for them and include some coupons at the bottom of the flyer to promote this. Then go around your area and take pictures of homes with outdoor holiday decorations and put them on your website. Or put them on your myspace page. Then promote where these pictures will be and how local residents can visit your page to vote for their favorite house. How can they vote? Either post something below the picture in your myspace site or send in an email. What kind of gifts? How about three trophies to the best decorated houses? Or ask around town and see if any other business owner would like to donate a prize to the winner. Send out a press release to your local paper to let them know you are conducting this contest and how readers can submit their pictures to you by emailing you. I also want to see the picture you take or are submitted. Maybe we can have a vote here for the best overall holiday decoration pictures. Here is a flyer to promote your lawn care businesses toy drive for the holidays. Offering to run a toy drive really positions your business as one who cares about your community. It's a great way to show your community that you care as well as gain you some valuable media attention. Make sure you let the local media know you are running a toy drive to collect toys for children in need. Download the Sprinkle these seeds lawn care flyer here. Lawn Care and Landscaping marketing flyers. How would it be as an additional service to offer outdoor decorations for a birthday party? What if you had a special package where you would insert a couple of signs and balloons at the house of a birthday party? What if you also brought an air dancer that could be left for the day? The great thing about offering something like this is that it doesn't cost you any big money to get started with it. It's not like you have to buy a piece of equipment to offer this service and then it gives you a chance to meet another homeowner who could use your lawn service. Are they too busy to cleanup their yard before the party? Here is a lawn care flyer for this service. Maybe you can use it to help reach out to more potential lawn care customers as you add additional services to what you already offer. You could then hand out these flyers in your area and post them up all over the place and attract others to your spring neighborhood yard sale. You could also have a table that promote your lawn care business and possibly offer discounts that day if a customer signs up with you for a year's worth of lawn care. Download the birthday sign flyer here. Here is a great tree stump service flyer Justin put together. Football season lawn care flyer. Don't miss a single football game, have us cut your lawn. 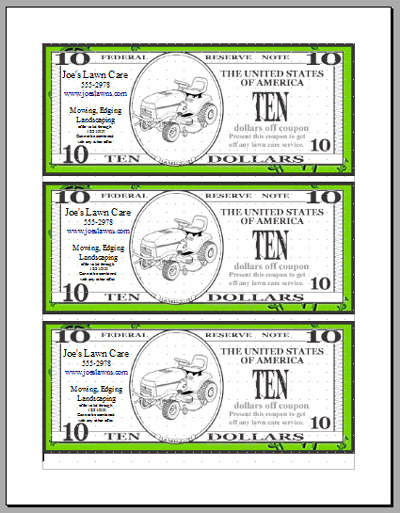 Here is a lawn care flyer template you can play around with. One image shows you what you could do with text and the other is without text so you can make your own. As I was going through my neighborhood the other day, I saw a sign posted on a telephone pole for a lost animal. People who were walking by stopped to read the flyer! Then I thought to myself, wouldn't this be a great way to attract new potential lawn care customers? Here is a lawn care flyer you could use to experiment with and see if you get calls from it. Hang these up in your area and see if they help. Fall yard and home cleanup flyer. Instead of handing out business cards, what if you handed out $10 off coupons? You could keep these in your wallet and hand them out to people as you meet them. It's better than a business card because it's like you are giving them a gift. Plus if they redeem it, they will be bringing you business so it benefits you! There are a few more designs at the original post here. $25 dollar gas card for referral customers. Matt made these great lawn care flyer designs. Thanks to Steve for sending in his lawn care aeration flyer! WOW nice work! We had a great discussion going on about promoting your lawn care business through schools by teaching mower safety. Here is a lawn mower safety worksheet that you can hand out to the kids in the class and they can color it in and write in the different things you need to wear to be safe.